TORONTO’S SCANDAL-PLAGUED mayor Rob Ford said today he is taking a leave of absence in order to enter rehab, after a new video emerged allegedly showing him smoking crack days ago. 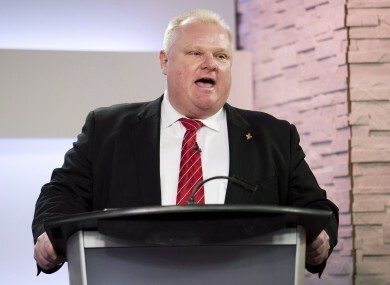 Ford, 44, has already admitted to binge drinking and smoking crack and is campaigning for re-election on a give-me-another-chance platform. The Toronto Globe and Mail published a screen grab from a video it said its reporters had viewed, in which Ford is seen holding a metal pipe alleged to contain the addictive cocaine derivative. In the full video, which the paper said was shot by a self-described drug dealer, the mayor of North America’s fourth largest city is seen taking a hit from a copper colored pipe, exhaling a cloud of smoke and shaking his right hand frantically, the Globe and Mail said. The dealer says the video was shot in the early hours of Saturday in the basement of the apartment building where Ford’s sister Kathy lives. Approached at City Hall yesterday evening, Ford declined to respond to questions about the video, the paper said. The newspaper said the dealer is trying to sell the video “for at least six figures.” The paper said Ford’s sister has also struggled with a drug problem. Meanwhile, the Toronto Sun tabloid posted on its web site audio of the mayor, apparently intoxicated, and captured in a bar Monday night. Ford can be heard swearing and lewdly commenting about several municipal and provincial politicians. “I have a problem with alcohol, and the choices I have made while under the influence. I have struggled with this for some time,” Ford said in a statement late yesterday, the Star said. The mayor, mired in scandal for months after being accused of unseemly behavior during a series of drunken rampages, has been stripped of most of his powers by Toronto city council. The mayor burst into international headlines nearly a year ago when another alleged drug dealer tried to sell another video of the mayor allegedly smoking crack, to media outlets in Canada and the United States. Then, Ford denied using the drug but later acknowledged he had smoked crack cocaine in a “drunken stupor” but said he was not an addict. Since then Ford has been filmed numerous times in public appearing erratic and acting impaired. He had admitted to drinking but never to using drugs. The anti-tax populist was first elected in a landslide in October 2010, picking up the support of 47 percent of Toronto voters, who liked his promises to cut taxes and slash wasteful spending. His diehard backers in the suburbs of the Canadian metropolis have kept his approval ratings high despite alleged ties to gang members, admitted crack use and embarrassing YouTube videos. The Globe and Mail said it was shown three videos of Ford shot secretly early Saturday by the alleged drug dealer. All three clips were filmed in a cluttered, dimly lit room with a white tile ceiling, it said. Lawyer Morris said it was hard for anyone to prove what is in the pipe the mayor is allegedly seen smoking. Email “Toronto's controversial 'crack-smoking mayor' to enter rehab”. Feedback on “Toronto's controversial 'crack-smoking mayor' to enter rehab”.